1.) 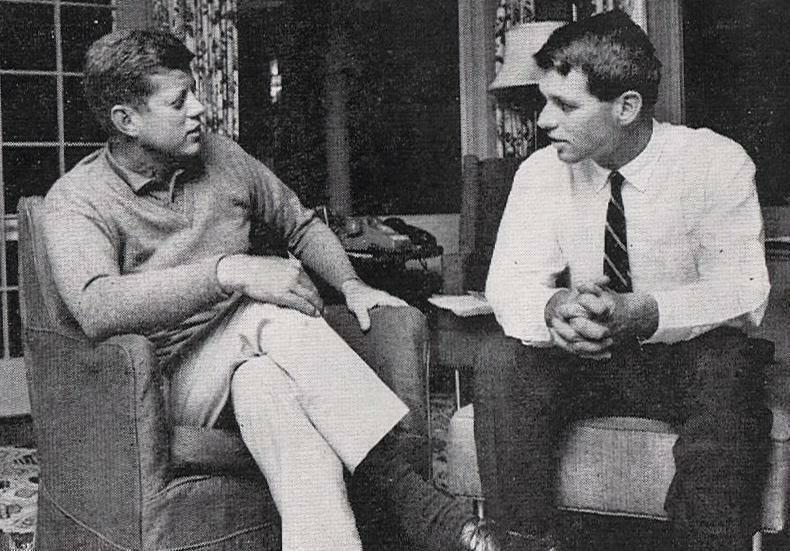 John Bates provided the alibi for Robert Kennedy, stating RFK could not have been in Los Angeles on August 4, 1962, the day of Marlyn Monroe's death, because Robert Kennedy was with him on his ranch in Gilroy, CA. His answers to BBC's interview were hesitant and he could not remember any reaction of RFK to hearing of Marilyn's death on the radio. 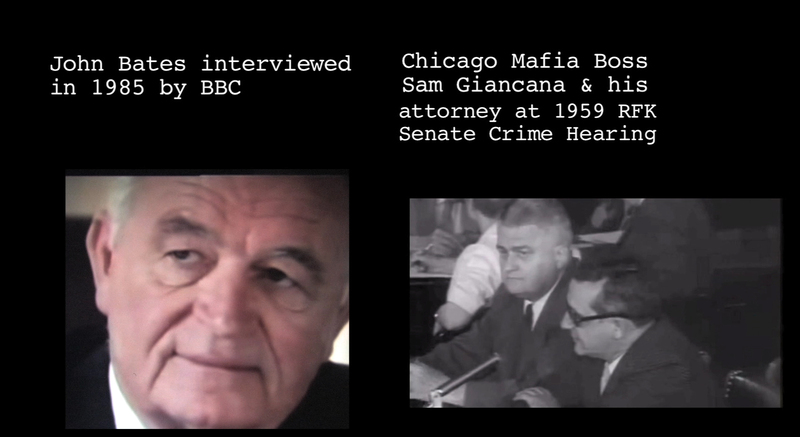 UNRESOLVED QUESTION: Isn't that John Bates as attorney to mobster Sam Giancana at the 1959 Robert Kennedy Crime Hearing? Can anyone confirm this is Bates? Giancana confessed to accepting a CIA contract to eliminate Marilyn Monroe, according to his brother Chuck, his nephew Sam and his mistress Judith Campbell Exner. 2.) Jose Balanos, a Mexican screenwriter, met Marilyn in Mexico when she went to visit Frederick Vanderbilt Field, son of the wealthy Vanderbilts who was disinherited for his pro-Communist views. The FBI spied on Marilyn during that trip, as proven by FBI documents. Jose was Marilyn's date for the Golden Globe Awards in 1962. In a 1982 interview with author Anthony Summers he claimed he made the last phone call to Marilyn, and that she put down the phone because of noise outside her house, and she never returned. He claimed she told him she knew dangerous secrets from the Kennedy's, including a secret that would shock the whole world one day. He refused to reveal the what the secret was. UNRESOLVED: Was he referring to what is reported in the CIA document about JFK and the Air Force base visit to see "things from outer space" (that is, aliens and the Roswell Incident, still believed by many to be Top Secret and highly classified)? The news article shows Jose was in Los Angeles when Marilyn died and police wanted to talk to him about that phone call, and papers printed a photo of him with flowers at Marilyn's grave. 3.) 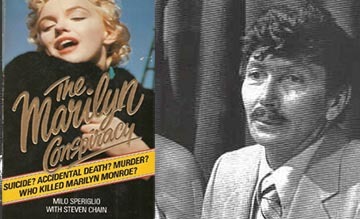 Noted Hollywood detective Milo Speriglio and his first book claiming Marilyn was murdered, which he worked hard to prove to his dying day. 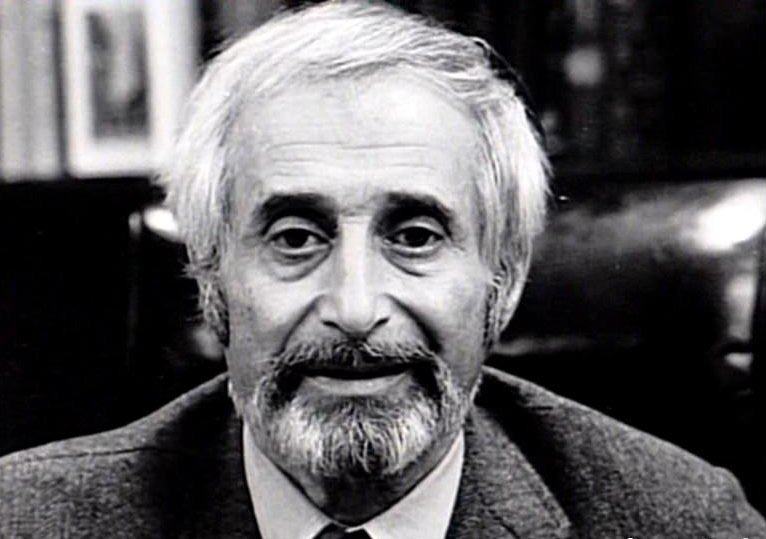 He was the first noted researcher to go public on TV with the CIA document and claimed it proved that Marilyn knew secrets dangerous to national security from the Kennedys... and was murdered to silence her. UNSOLVED: Did he hear the wiretap tapes from Bernard Spindel reportedly made the day of Marilyn's death, as was claimed on a TV news show? Was that why he pursued the case relentlessly? 4.) In the book Crypt 33, The Saga of Marilyn Monroe: The Last Word, by Milo Speriglio and Adele Gregory, the names of the actual Mafia Hit men that San Giancana sent to murder Marilyn are given. A case is cited in detail about the girlfriend of one of the hit men being murdered also because she overheard about Marilyn's murder and talked. UNSOLVED: Did Speriglio name the correct killers and where did his information come from? Is there any evidence for his claim Marilyn was pregnant in the summer of 1962 with Robert Kennedy's baby and got an abortion at RFK's insistence? 5.) The photo shows wiretapper Bernard Spindel with Jimmy Hoffa, who was later murdered and his body never found. 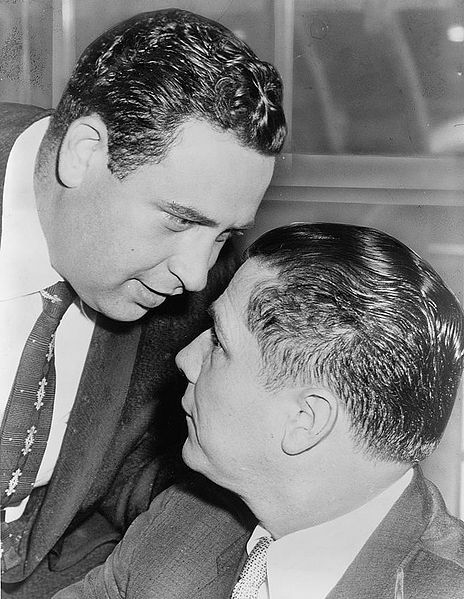 According to Spindel's associate Fred Otash, Hoffa hired Spindel to supervise bugging the homes of both Peter Lawford and Marilyn, which Otash did. UNRESOLVED: Was there never a backup copy made of those wiretap tapes? Were the original tapes, that were confiscated by a New York district attorney in a raid at Spindel's house, destroyed? (Existence of the tapes was established in court filings and referenced in a New York Times article). Was Spindel, when convicted, deliberately deprived of his medicine so he would die in prison? 6.) 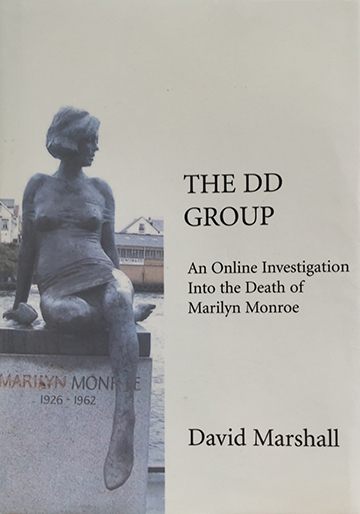 The DD Group Book (Death Deliberation Group) in 500 pages is the most detailed examination to date of the days and hours leading up to Marilyn's death. Although author David Marshall says he finds the CIA document fascinating it was never incorporated into the conclusions because the group, for very flimsy reasons, judged it not credible. They did not realize it was authenticated by the CIA which accepted it as bona fide for an appeal in a Freedom of Information Act case and that it has been verified on other grounds by the Majestic Documents research group. They did not reference the FBI 3-page memo on Robert Kennedy and Marilyn (which like the CIA document asserts she intended to "go public" with sensitive information) and did not know a news article proved that Jose Bolanos' claim of making the last phone call to Marilyn was referenced in an August 1962 news article. They ignored the 1982 Bolanos key interview. UNRESOLVED: Of 12 members of this online investigation, 11 concluded Marilyn was not murdered. Given that so much of the data in this book is accurate (and they accurately concluded RFK did visit Marilyn on her final day), were they objective in rejecting the murder conclusion? Who were the members of this group and were there any personal agendas by group members? 7.) 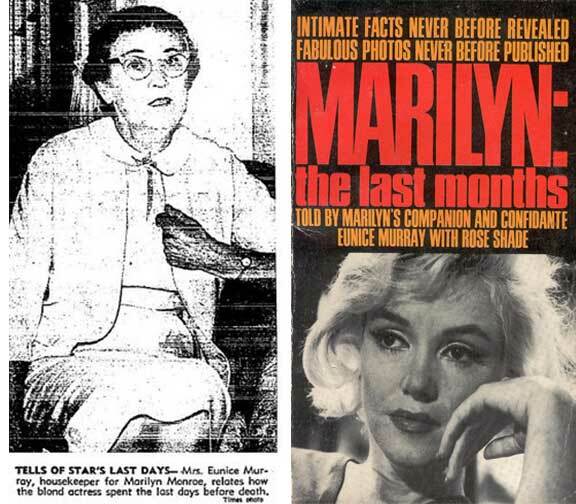 Eunice Murray, Marilyn's housekeeper, stated to Sgt. Clemmons the night Marilyn died that the door to Marilyn's room was locked from the inside and she and Dr. Ralph Greenson (Marilyn's psychiatrist) had to break a window to get to her body. This seemed to support the suicide story. 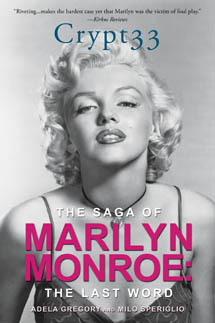 But Marilyn's death was reported to main Marilyn publicist Arthur Jacobs by 10:30 August 4, and Sgt. Clemmons was not called for 6 hours, until about 4:30 a.m.August 5th. Eunice never mentioned in her book that Robert Kennedy visited Marilyn the day of her death (withholding key material evidence). Decades later in a BBC recorded interview Eunice admitted Bobby Kennedy was there that day and that they had a fight. She also admitted the door was not locked, blowing apart the story about the reason for the broken window. UNSOLVED: Was Eunice paid for her silence? Was she threatened to remain silent? She was sleeping in Marilyn's house the night Marilyn died. Did she hear a commotion, intruders? What did she mean when she stated on tape that "it got so sticky that the protectors of Robert Kennedy stepped in"? Why was she never subpoenaed to testify under oath? 8.) Dr. Ralph Greenson was taped stating that he could not tell the whole story and that those with questions about Marilyn's death should "talk to Robert Kennedy". His tape of Marilyn's final 2-hour therapy session is kept under seal at UCLA by his family and won't be revealed for another 25 years. UNRESOLVED: Should it be considered obstruction of justice that Dr. Greenson's tape is still sealed? Why did he say to Deputy District Attorney John Miner that he did not believe Marilyn committed suicide? Why did he offer a false story about breaking a window to get into Marilyn's room when the door was not locked? Why did police not report a skeleton key would have been needed to lock the door, and there was none? Did Dr. Greenson lie to the public and his own family to protect Robert Kennedy, whose presence at the house that day would have been very incriminating. 9.) 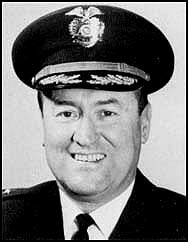 Chief of Los Angeles Police Thomas Reddin (who served subsequent to Marilyn's death) stated definitively and authoritatively in a taped interview (in our film and the trailer at this website) that the aftermath of Marilyn's death was handled as a police intelligence division operation, highly secretive, and that this was appropriate because of the involvement of Attorney General Robert Kennedy and for reasons of national security. But when asked what the national security issue was he stated: "Frankly, I don't see any." UNRESOLVED: Was Chief Reddin unaware of the national security issues because they were still top secret? Were they the same national security issues mentioned in the CIA document? Shouldn't Chief Reddin's statement end the debate about whether Robert Kennedy was involved (along with the similar statements of Dr. Greenson and Eunice Murray)? Shouldn't it be taken as proof of an official coverup that included the police department? Were all the police documents destroyed, as reported by the BBC, or given that it was an intelligence division operation were they classified top secret and never declassified? 10.) UNRESOLVED: What was the extent of JFK's relationship with Marilyn Monroe? All scholars accept at least one sexual liaison but the extent beyond that is disputed. Some claim a longstanding affair of at least several years and others deny that. Was Robert Kennedy also involved with Marilyn sexually, or was their relationship limited to companionship and close friendship? Does the extent of involvement matter in terms of evaluating Mafia actions to discredit the Kennedys and eliminate Marilyn, as confessed by mobster Sam Giancana to his family members and mistress Judith Campbell Exner? 11.) 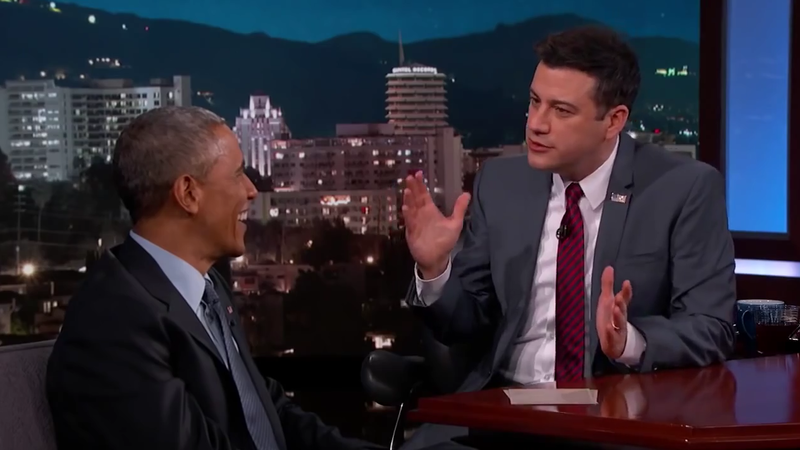 When pressed by Jimmy Kimmel on TV to discuss whether the government has information that confirms aliens are real and some UFO's are alien spacecraft, President Obama noticeably stuttered as he said "I can't reveal that." It is the first time a President admitted that there is something to this subject that cannot be revealed. UNRESOLVED: What is it that the President cannot reveal and why can he not reveal it? Does this add credibility to the CIA Marilyn Monroe document that referenced JFK revealing such things to Marilyn Monroe? Did her having top secret information of this kind (and other top secret information she should not have had) place her life in jeopardy? Back in 1962, would the CIA have eliminated "the President's Hollywood girlfriend" (using the Mafia to "handle it") to protect this kind of information from being made public?